After procrastinating for an awfully long time, today I've finally packaged up and released the instructions for getting Need for Speed 3 and 4 to run, kindly provided by Mark Bell. If you're having trouble with these games, go have a look. And then, I'd like to announce that significant performance tweaks are coming up. First, the Project64 and Glide64 crowd is going to have to wait a little while longer for the much desired TEXTUREBUFFER extension and (after all these years ...) multi-texturing support. The LFB emulation is going to get its major overhaul first, and this time it's an all-out performance kind of overhaul that will hopefully please people who play games like Jane's F15. These are currently bottlenecked by readback performance more than anything else, especially in high res mode. I now have a few new tricks up my sleeve to greatly speed up high res readbacks (*cough*), but essentially everything LFB related is faster now. Now, some percentage may still be lost or gained because there are some remaining issues with the robustness of the new solution. Anyhow, this should end up delivering enough of a performance improvement to finally make high res mode a viable option for every game that runs at all. MDK's performance index OTOH doesn't care about readbacks at all, it only writes to the LFB. And it's up, too, from 430 to 480 if I play it fair. But beyond playing fair, I've implemented another optimization for MDK ... don't get this wrong, it's an entirely valid, legal and robust optimization, but MDK really is the only game that benefits at all. 1100. Same system. No kidding. This will be in. I have a donation page up. If you like my Glide wrapper and want to encourage development, I'd appreciate if you'd at least take a glance. Thanks bunches. I hope you'll have a fun and peaceful christmas. Take care. See the "thread policy" thing? This will basically let you choose between old behaviour, much like 0.80e plus a few bug fixes, so that games that worked with that version aren't broken, and a variety of "new" behaviours, that do multithreading to various degrees. I would have very much liked to get a "one size fits all"-solution, but as I couldn't, I figure it's good if the new stuff can be tuned, and turned off. And that shot shows another new nicety: profiles can now be renamed at will. No more figuring out exe names. Go me. a fix for the blurry cockpit views in Jane's F15 has been implemented. However, it is currently unknown whether this version can support Jane's F15 at all. The "To be continued" demo by Sawtooth Distortion now renders all text correctly. UltraHLE stutters like mad and stops registering the ESC key after pressing other keys (ie you can't quit properly once you start playing). Diablo II still reacts to the Windows key, but not by minimizing. Instead, it loses (mouse/keyboard) focus. That's worse IMO. Robo Rumble doesn't register mouse clicks/key presses. No way to play, no way to quit. General performance in CPU limited situations is reduced. Eg Unreal I intro flyby benchmarks are down by roughly 10 per cent on my system. Speed Busters doesn't register mouse clicks. You can't start any race, you can't use the menu, you can't even exit properly. Star Wars: Rogue Squadron doesn't register key presses except for the arrow keys and backspace/del. You won't be able to create a player profile, so you can't play. As I was occupied with this basic Windows interaction cruft exclusively for the past weeks, I unfortunately didn't get around to implement any rendering improvements from my "roadmap". Even the most miniscule change to Windows integration can render meaningless all testing done before the change. This is not my idea of making progress, and I hope I'll get over that hill quickly. When using a single processor machine, and one of your threads is waiting for another thread to do some work, you need a way to tell the thread scheduler to switch to that thread, so that it actually gets anything done. As it turns out, Windows' sync primitives not only trigger thread switches all the time, even if you don't want them to, but they are the only reliable way to switch threads at all. During the research phase calling Sleep(0) did the job perfectly. Put the current thread to sleep, so that the thread scheduler starts some other thread, and hopefully it will be the one we're actually waiting for. Worked fine for the vast majority of games I tested, but somehow produced severe stuttering and extremely low performance in a handful of other games. And then I found out why. "A value of zero causes the thread to relinquish the remainder of its time slice to any other thread of equal priority that is ready to run. If there are no other threads of equal priority ready to run, the function returns immediately, and the thread continues execution." Why, oh why? Who designed this? "The SwitchToThread function causes the calling thread to yield execution to another thread that is ready to run on the current processor. The operating system selects the thread to yield to." So, had that brilliant person who originally designed the Sleep functionality not tried so hard to be clever, the result could have been actually sensible, and I could stand by my word and not use Windows' sync primitives. Guess what, the plan had to change. On a more positive note, Need for Speed 2SE runs. Perfectly. Yay. Expect a release Real Soon Now. Note to self: must make more regular use of the blog. I did it, yesterday. The wrapper is now fully separated into a frontend and a backend, which runs in an extra thread. Both parts are connected by a asynchronous read/write FIFO. There's also an asynchronous memory manager to shove extra data chunks through the FIFO, in cases where it's hard to determine up front how big these chunks are going to be (mostly vertex buffers and index buffers). There was the usual fallout of crashes and failed assertions, but it's coming along nicely. Hopefully, very soon now, this will allow smooth sailing in most of the "tough" games, like Need for Speed 2, Rogue Squadron, Rollcage et al. The bad news is that performance will be down. I'm currently at about 25 per cent slower than with previous versions. The good news is that it could have been worse. I've done a lot of research on this thread communication thing, and I think I made all the right choices. I don't use Windows' built-in thread synchronization primitives, with the notable exception of "critical sections" because I knew all along that they are failed designs and would just slow me down. For the technically inclined who might wish to object to or question that statement, the fundamental flaw with Windows' sync prims is that every event signal implies an immediate thread switch. You can't circumvent this. This makes the technique useless for asynchronous comms, because a)your sender thread will have a hard time to "run ahead" by a significant amount, it will always be suspended immediately after signaling that a new packet is available to the receiver, b)your receiver thread will have very few data packets to work on, most of the time, and will just quickly go to sleep, either because it runs out, or because it signals free FIFO space to the sender (see point a), and c)consequently, there'll be extreme pressure on the thread scheduler. The thread scheduler manages about 650k thread switches per second on my Athlon XP2400+. Interestingly enough, this figure exactly fits the performance limitations of Microsoft's own DirectX. In .NET, they circumvented the problem by making thread communication going through network sockets, but this is really a very ugly hack that just avoids the issue of misdesigned sync primitives instead of fixing it. And I already have that async mem manager. It's still a bit too slow, but it's reliable. It just works. A lot of the overhead is in there, so I have a good idea on where to concentrate tweaking efforts. On a related note, the next version will fix the blurry textures in Boss Rally. And I had a nice idea for the framebuffer readback speed issues that plague some very popular classic flight sims. You know, as I always said, the root cause is that neither ATI nor NVIDIA ever (until the Geforce 6, that is) bothered to fully utilize the downstream bandwidth provided by the AGP, and instead insist in their marketing material that more than ~200MB/s just isn't possible with AGP and you'd need to wait for PCI Express. I have a Wildcat VP AGP4x card here that nicely disproves this nonsense with roughly 700MB/s of actual delivered downstream bandwidth. Ha! If you want to run these games faster, and have the money to burn, the most obvious and immediately available solution is to go out and buy any Geforce 6 series card. Those are mucho fast at reading back pixels. Almost on par with the Wildcat VP. My idea, to finally get to the point, was to avoid the "read everything back" procedure when a game locks the framebuffer for reading. 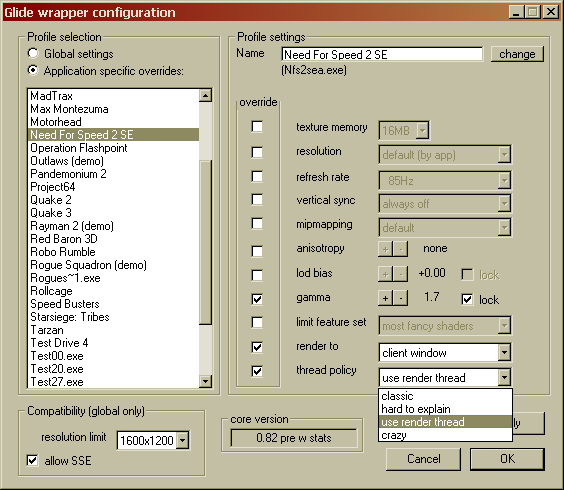 The wrapper does so, because it cannot know which parts of the framebuffer the application is actually going to read. It may be a lot less than the whole buffer, sometimes just a single pixel, sometimes nothing at all. The "correct" way for an application that needs only a few pixels would be using the grLfbReadRegion entry point instead of locking the whole buffer. But it's too late now to fix those old games. And that's basically the whole problem. Inspiration came in the form of memory exception handling. If, instead of getting everything prepared immediately, I just let the application try to read from an empty "guard page", Windows will roll its eyes and throw an exception. Without further precautions, the application would just crash. But if I catch that exception (which is a bit quirky, but possible), I also get to know what part of the framebuffer the application wants to access, and can, still in the exception handler, read back just that part. This will likely not make it into the next release, but it looks like a nice solution and I'll definitely go for it. If it turns out to actually work, you may look forward to healthy improvements in Jane's F15 et al. Now wouldn't that be great? I've managed to reproduce what I think is the cause for blurriness in Jane's F15 cockpit views. Under certain circumstances in high res mode, the current framebuffer is read from the card (and downfiltered in the process, because the application expects e.g. a 640x480 buffer, not 1280x960) and later written back. This causes some problems with points. Depending on the coordinates of the point primitives, points can "smear", i.e. they blow up to twice their intended size and get dimmer as a result of the downfilter/writeback sequence. I've written a minimal Glide app that renders some points and locks the buffers, and I encountered the problem. It has been fixed in the current code base by forcing all points to lie exactly on pixel centers. The next release (whenever) will have this fix. In all fairness, I've noticed that automatic mipmap generation doesn't work on Geforce cards for paletted textures (tested on an FX5700 with FW61.76). The textures come out corrupted. So this "workaround" would benefit both ATI and NVIDIA users. NVIDIA users will lose hardware palette support in the process, though, if automatic mipmap generation is activated. I.e. auto mips and hardware palettes will become mutually exclusive.